Boats and kit were unloaded and the shuttle started. While waiting we took the boats down to the ‘get in’. The river was running just high enough, and it was white water straight from the word go. John, Steve, Sarah, Martyn, Tom, Andrius and myself got in our boats and we all seal launched off, and warmed up under the bridge. Then the fun began. 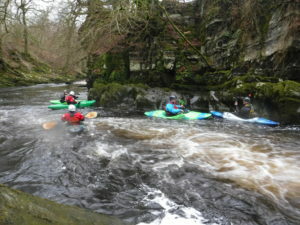 The river Conwy is a series of( I thought) tricky sections ,which required quick powerful manoeuvring strokes especially in one section called Bryn Bras Falls. This was pretty full on, and to my surprise I cleared it. We unfortunately had one swimmer to rescue which required a throw bag for the swimmer, and a carabiner and sling to recover the pinned boat. As the water level was 1.25 on the gauge at Penmacho Bridge although we got out 1km beforehand with the levels as they were there was plenty of rocks to watch out for and manoeuvre around. I really enjoyed the Conwy although I had a swim myself, it was too shallow and rocky to try my perfected roll from the pool sessions. 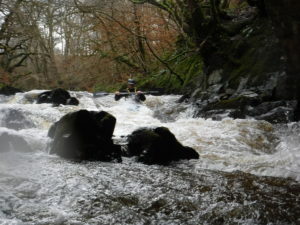 If you have been doing the whitewater course at the centre, I really recommend going on a white water trip with the club, to discover how useful all the skills you learn on the course actually are when applied on a real white water river.